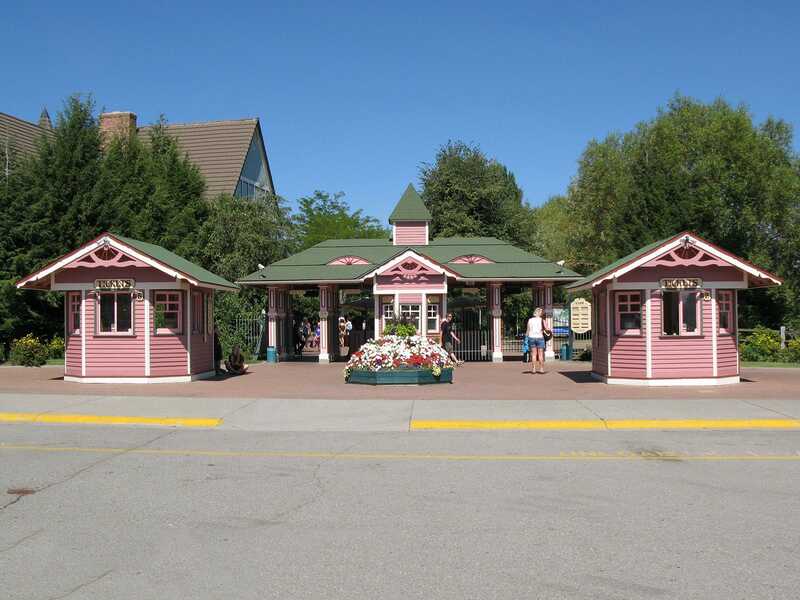 Silverwood Theme Park is located in a remote area of Idaho that might best be termed the middle of nowhere. Given that, the size of the car park borders on the astonishing; the place is clearly extremely popular. We arrived within a few minutes of opening yet there must have been at least two thousand cars present in the car park. Interestingly enough the vast majority of the cars in the car park had Washington plates, indicating that the locals have better uses for their time. The park itself is very reminiscent of Silver Dollar City, albeit without the theming. There are a few areas of shopping that might have been taken from the old west (or, for preference, a Back to the Future movie) but the rides themselves look like what they are; amusement rides placed within landscaped gardens. There is an overpowering sense of relaxation in the park as a whole, particularly evident in the operations of the roller coasters. The three signature rides all have a single train which is loaded with almost painful slowness. It quickly became evident that we'd only get a single ride on each coaster if we wanted to be at our overnight hotel before midnight. One ride was always going to be enough on Corkscrew (#1043) and Tiny Toot, but it would have been easy to spend hours between the two wooden coasters. George was particularly taken with Tremors (#1044), a lively twister design with several tunnels. My own experience was pretty jarring, though, making me wonder whether it is time for a bit of track replacement in places; it wouldn't take much for this to be a top ten coaster. The layout was particularly gripping, with an emphasis on maintaining the overall ride pace while still providing some excellent vantage points for onlookers. There was only one dead spot on the whole ride, where the train crests a hill slowly just before the final tunnel. The momentum is lost just long enough for riders to catch their breath ahead of the last ten seconds of coaster. The maintenance appears to have been better on Timber Terror (#1045), which felt a lot like a shortened version of Shivering Timbers. It is a relatively gentle wood coaster with some wonderful floating moments over the hills. These are accentuated by the buzz-bar restraints on the train, which keep riders in the train while allowing them to experience the weightlessness to the full. The voice over in the station lists this ride as the premier wooden coaster in the park, and while that probably refers to age I'd argue it applies too to quality. Having said that there'd be very little between them if both coasters were in as-new condition. There are very few parks with a solid one-two punch of wooden coasters; Holiday World is the obvious example, and Indiana Beach is a personal favourite of mine. I'd like to nominate Silverwood as a third park in that list; it is an absolute gem, and well worth driving several hours for.